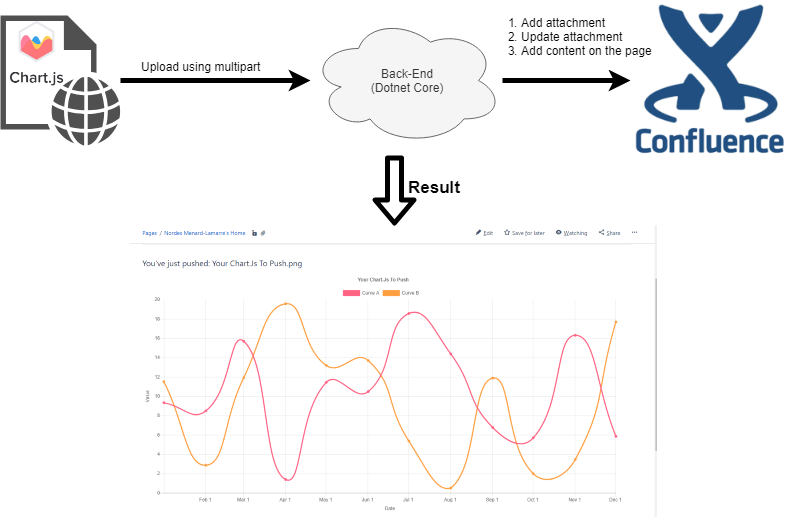 Today, let’s create a connection between one of your app using ChartJs + Confluence and send or synchronize a chart. The flow with Confluence server used will be with the basic authentication. In the case you want to build a real plugin/extension to Confluence, please follow the proper guide about it. In this blog post, the basic authentication is simply a mean to an end for quick prototyping. A complete example of a standalone project can be found on Github (https://github.com/Nordes/HoNoSoFt.PushChartToConfluence.Sample). How does the resizing work? Note that we’re going to add the chart, but the same flow could be used to also update some comment/text. As long as you are familiar with html syntax, you should be able to do something good. Select a Confluence server license and keep that page open until the docker image is ready. During installation, fetch the Server ID and input it in the evaluation page. In the back-end, we will first be receiving the image to at least test our local upload between front-end and back-end. After, we will start integrating the Confluence connexion. Let’s create a controller named ImagesController we will receive the files as stream and then copy those files to a temporary folders. If you already played around with file streaming you can probably skip this part. /// This will save the image in your local "temp" folder. // Example of processed uploaded files returning details of the new file + original request. // You shouldn't rely on (or) trust the FileName property without validation. This is named Part 1 since we will come back in that code in order to add some code to send to confluence. You will see in the next sub-section how to start from a ChartJs chart which you’d like to push to your back-end having a resolution of 1200px wide. Don’t forget that if you use an adaptive screen UX, it will not be displayed as 1200px until you do a snapshot for a fraction of a second. Interesting part in the JS, I will skip the trivial step of generating a chart since you’re I suspect that you’re already able to do so. // Resize to desired size, bigger it is, more heavy will be the blob file. // might want to have something more precise based on parameter (hash, encoding, something). As you can see, I resize to 1200px => snapshot (toBlob) => resize back to original => send the file as multipart/form-data to the api. The file should normally be created within your temp folder and the exact location will come back through the API. It is also part of the current data contract. Now that you have that, you can consider yourself ready for the next step, which is to transfer that buffered binary data directly to confluence using their API’s. Search/Retrieve the existing attachment. In case it does not exists, it will sends back an empty array. Retrieve the details on the current page, especially the body specified in readable/editable way (storage). The version is also mandatory when you want to update the page. Api used in order to update the confluence page. There’s maybe more code than required in the controller. The proper approach would be to use a IDataProvider injected (for UT) and then implement the provider using the IHttpClientFactory. That way, all would be testable and also it would also put the logic where it should be. However, let’s put all for now in one place and please adapt for your needs. /// Receive 1 or more images to be sent to Confluence server. // In case we had multiple tasks at the same time. // Add the file if not present on the page. // Else: Nothing to do, it's already on the page somewhere. // While previous request goes on, let's get the file. // Result is 1 "item"
// Result is a list of item. It’s a lot of code. By reading it, it should be really easy to understand. During the file upload to Atlassian Confluence, we add a comment (updated or created) and the version gets updated. That way you could show the changes over time. Send the image using a job. Send a SnapShot (not necessarily from Charts) while building your backend app in a pipeline. Thank you for reading and I hope you have learned something today, or at least enjoyed this article.